Today I want to show you something astounding. If it doesn’t seem astounding at first, wait for it . . . This is pretty basic, right? 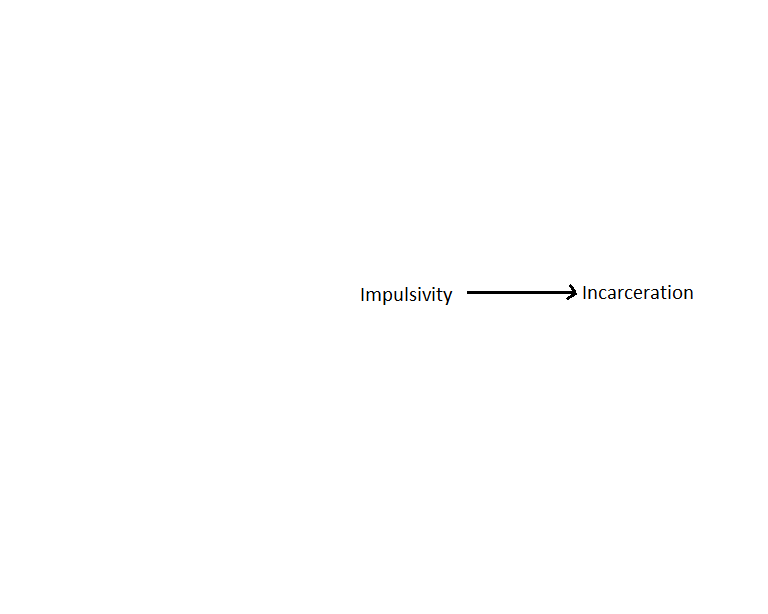 We have good evidence from many different studies that suggests that impulsivity (defined as initiating action without adequate forethought) is a key factor in incarceration. But it begs the question, doesn’t it . . . why are some people more impulsive than others, and thus more likely to get into trouble with the law? Well, of course, we don’t really know for sure, but we have some strong evidence that it is at least partly “genetic,” which makes sense if you consider that most incarcerated people have family members that have been or are incarcerated as well. But mostly I want to focus on three other possible causes beyond the “genetic” (genetics, by the way, are far more complicated than we sometimes make them out to be, which is why I like to put it in quotes like it’s something of a quaint idiom). Intrauterine hypoxia occurs when a fetus has an inadequate oxygen supply. Although there are many possible causes, cigarette smoking is one of the most preventable causes. And cigarette smoking is strongly correlated with lower income and education levels. 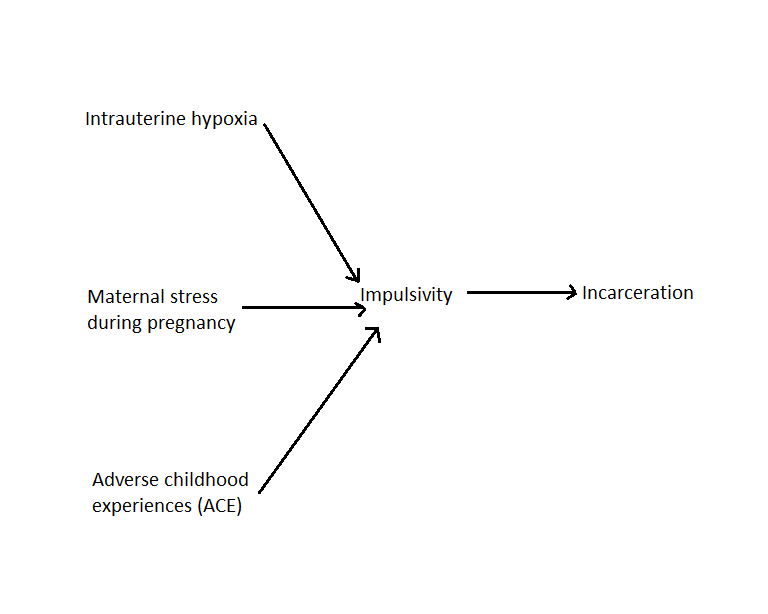 Maternal stress during pregnancy . . . there’s still a long way to go with this line of research, but there is some fascinating stuff already. The bottom line is that we have growing evidence that maternal stress and anxiety during pregnancy impacts not only an infant’s functioning but has effects well into childhood. For example, one study found that “prenatal anxiety was significantly associated with behavioral regulation problems, impulsivity, and attentional difficulties” in 8-year-old children. The ACE study is another interesting one: in short, they found that exposure to childhood trauma was significantly related to a host of medical problems in later life. Other studies support the conclusion that adverse childhood experiences actually alter kids’ chemistry at the epigenetic level. So, for example, some kids’ “fight-or-flight” response is altered in such a way that they stay in a “fight” mode, which appears to be tied to impulsivity. Not surprisingly, adverse childhood experiences are correlated with lower income levels as well. I wish I had loads more time to write and talk about this, but since it is actually peripheral to my thesis, I really really don’t. But if you possibly have time, I highly recommend two recent RadioWest (a production of the Salt Lake NPR station) shows: The Poverty Clinic, which talks in depth about this New Yorker piece, and The Social Animal, in which David Brooks discusses his recent book. (These podcast links may expire because it seems that the website replaces them with new shows as they occur, but the article and book will remain available.) I don’t have time to go into detail about how these particular radio shows tie in, but trust me, they do and are fascinating to boot! First, if you are one of the personally-hoping-to-change-the-world camp, this should alert you to the fact that it is FREAKING HARD. (Or so one of my undergraduate students told me she realized yesterday after class.) The situation is endlessly complex . . . there’s societal, community, family, genetic, epigenetic, and even “maternal womb environment” factors. And the conclusion that many people are coming to is that we can’t impact poverty in such a piecemeal manner — better education! therapy! immunizations! after-school programs! parenting classes! Not that any one person can be an expert in everything, but we need to think holistically and expansively and interdisciplinarily. We need to be looking for gaps that our program or effort is not filling, and try to connect the people we serve with some other person/program that could fill it. Second, when I work with undergrads who are encountering incarcerated individuals for the first time (either in person or through our data or in previously-published studies), I see them struggle with the same thing over and over again: I feel sorry for them, but they must pay for their mistakes. It’s sad that their families have to suffer, but they made the choice themselves. Justice. . . but mercy? Mercy, yes, but what about justice? It can be this endless back-and-forth for some of them, which I think is a natural and legitimate struggle. But I also think it’s the wrong thing to focus on. What I try to get across — with varying degrees of success — is that they are not personally responsible for society’s law and order, they are not personally knowledgeable about or involved in any individual’s legal case. And because they don’t bear that responsiblity, they are completely free to choose only compassion for them. And indeed, when we realize just how many difficult circumstances most of them have had to endure, how the deck is often stacked against them in both obvious and subtle ways, it’s likely that no degree of compassion would be too great to extend. This may be true for all of humanity, but I promise, it’s true for every single incarcerated person I have ever met. Fantastic post, Lindsay. I especially love that final point about how, given no direct involvement with a situation, we’re free to choose straight-up, unabashed compassion. I haven’t thought of things in those terms before; my impulse is toward that kind of compassion, but I usually feel like I have to balance that out in the sort of justice/mercy dichotomy that we’re always lauding. But, oh right: I’m not God. I’m not responsible for meting out the appropriate levels of justice and mercy in every conversation about a person. Seeing things like that chart above (with some of the contributing factors to impulsivity) reminds me that it’s not just about the choices we make in life; it’s also about the EASE of the choices we make. True, I don’t choose to go out and rob a bank, but comparatively speaking, it may be much easier for me to make that choice than for someone who is hard-up for cash and is in a desperate financial situation and has access to firearms that would aid in a bank robbery (and, it might be said, is “genetically” predisposed to impulsivity). I can’t not be compassionate on somebody who had a harder time making a “good” choice and ended up making a “bad” one; similarly, I can’t not be impressed with somebody who had a harder time making a “good” choice than I did and made that “good” choice anyway! In the whole justice/mercy equation, I can only imagine that the ease of our choices will factor in alongside the choices themselves. With the absence of all the info needed to know exactly what’s going on, I vote that compassion is called-for. Love this post! Your conclusion at the end is so helpful to me!!!!!! Thank you! It just finally connected the whole judge not thing . . . I mean, if we have to deal directly (as in choosing consequences for behavior) with someone we must, as Blaine Fowers interprets justice, make reasoned choices on how to proceed, but if we don’t (as in, it’s not my job to enforce the law), I can just focus on loving. Love that. I loved this post. Loved, loved, loved it. I also struggle with that constant tug of war, so thanks for putting things in perspective for me. Trying to change the world IS freaking hard, you’re right! Right now, I feel like more education(!) is the buzzword in development. It’s a solve-all, a cure-all; I’m waiting, ’cause 20 years (or less) from now, we’re going to find out how we were wrong in our assumption that education would make everything better and why. I’m in no way saying I think education is a bad thing, or that it doesn’t need to be improved or made more accessible, but is it really a panacea? Developers thought that about technology and economic reform and they were obviously wrong in both cases. Anyway, I think your call to evaluate the gaps between different methods of solving these issues is spot on. Relevant marshmallow discussions held? Check. Avoid prison sentence? Hopefully Checkmate! Do comments make sense? Ah, rationality again. A new day’s light might bring a lucid story or two…Neal, Robin-Elise may even know some! I’m not an expert in your field, but these are ideas that have always been innate for me. We can often pat ourselves on the back knowing that many of the good things we have in life have come to us because of good choices we have made. Yet, I have always asked myself, “Why is it so easy for one person to make good choices and so hard for another.” It is a subject that fascinates me and I do completely agree that wherein we have no responsibility in the justice department we must show compassion. If I am sitting on a jury then I must consider justice from a societal standpoint, but from an eternal standpoint I believe in compassion. I once asked my son, “Do you think God wants justice or mercy?” He answered that he thought God wanted justice to which my reply was, “No, God is bound by justice, but He wants mercy. How do I know? Because He sent His son to meet the demands of justice.” Anyway, keep up the good work. By the way, I am Meghan Romney’s mother. It’s no wonder that sometimes incarcertion is a buffer from the world and its inequalities sometimes.